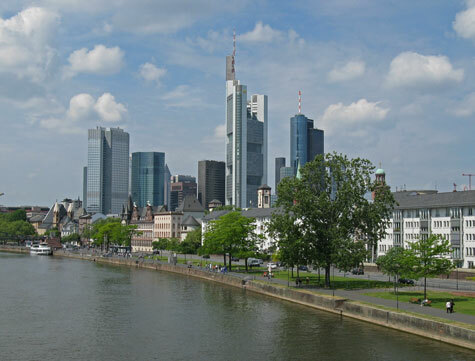 Famous Frankfurt landmarks include Main Tower, Schauspiel Theatre, the European Central Bank and the Kaiserdom. Popular tourist attractions in Frankfurt include the Old Town, the Frankfurt Zoo and the beautiful waterfront parkland. Top museums in Frankfurt am Main include the History Museum, Modern Art Museum and the German Film Museum. An assortment of hotels can be found in downtown Frankfurt, near the Frankfurt Airport and other districts. Direct flights to the Frankfurt International Airport are available from over 200 cities. The city has an excellent public transit system.